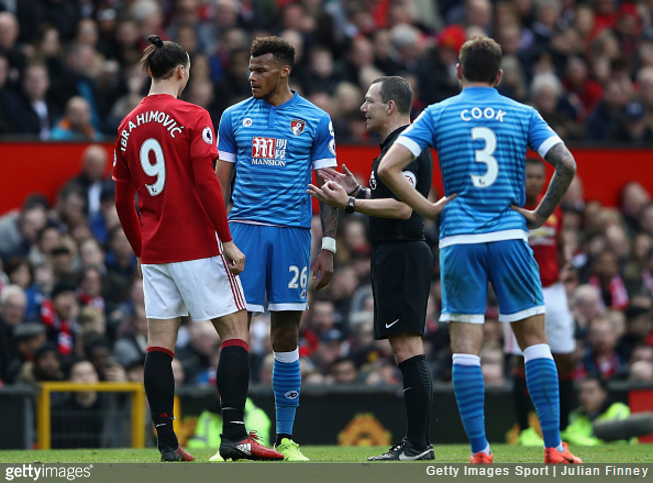 The FA have levelled violent conduct charges at both Zlatan Ibrahimovic and Tyrone Mings after their pair spent Saturday afternoon knocking lumps out of each other. Ibrahimovic and Mings tangled on several occasions during the 1-1 draw between Manchester United and Bournemouth at Old Trafford, with faces being scrawked and elbows being chucked about with gay abandon. Furthermore, The FA has submitted a claim that the standard punishment that would otherwise apply for the misconduct committed by [Mings] is ‘clearly insufficient’. As the incidents were off the ball, the decision was referred to a panel of three former referees, who each viewed the footage separately before unanimously deciding that the incident(s) in question were red-card offences. Both players have until 6pm on Tuesday 7th March to reply to their charge.